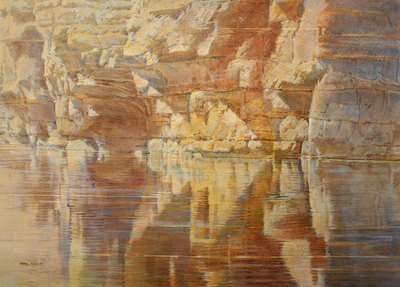 Merrill Mahaffey, Eminence Cliffs, Acrylic on Canvas, 38" x 56"
Landscape artist Merrill Mahaffey revisits two familiar locations in his newest work: the Grand Canyon and Lake Powell. He painted the latter area in the 1980s and hasn’t been back since. “It was fun to visit new canyons and see the water level,” says Mahaffey. 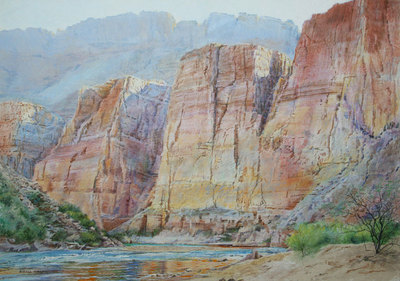 Best known for his luminous paintings of the Grand Canyon, Mahaffey has spent his career “interpreting the landscape to express concern for maintaining a natural wilderness.” He has an attraction for the monumental scale of the geological formations of the Southwest. In keeping with his latest theme of erosion, Mahaffey’s new images include distinct interpretations of going into narrow-sided canyons and looking at fractures that descent into water and making reflections in it. 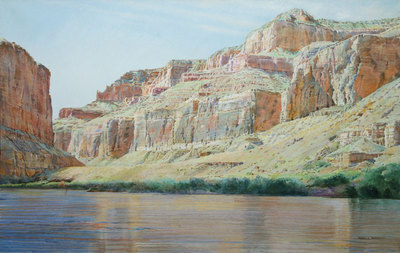 Examples can be seen in Canyon Pearl and Navajo Corner Reflection. Merrill Mahaffey, Intersecting Reflections, Acrylic on Canvas, 46" x 64"
An avid traveler, Mahaffey has traversed the Colorado River through Grand Canyon 29 times, capturing its sensuous beauty and magical light in his paintings. Fascinated by the canyon since he first saw it in 1961, the artist incorporates forms and symbols he observes into his work. When Mahaffey travels, he says, he does so as a person searching for the meaning of the land. And, as his focus shifts, so does the imagery. Each of Mahaffey’s paintings conveys his feeling toward a place. His romantic-realist style doesn’t idealize the subject but rather distinguishes it from other contemporary landscapes. Painting in up to eight color layers makes his work look unique and keeps it fresh. He attributes this distinction to his use of colors. He depicts space with color rather than light and dark. Merrill Mahaffey, Red Wall Morning, Acrylic on Canvas, 40" x 60"